Udo, a jewel-like island some 3.8km northeast of Seongsanpo, the far end of Jeju Island, literally means the island of cow and is named so as it looks like a cow lying on the ground with its head protruding.. If you look at it at the coast of Jongal-ri, Gujwa-eup, Bukjeju County, you will immediately recognize the unique shape of the Udo island at a single glance. The island is 3.8km long with the circumference of 17km and the area of 650ha. Udo has been inhabited since the state owned farm was established in the 23rd year of King Sukjong’s reign (1679), some 150 years ago. People from the mainland started entering the island to raise state-owned horses and the state delegates led by district governor Seok-rin Kim settled in the island in the 10th year of Heonjong’s reign(1844). As of 2012, Udo houses approximately 630 households with some 1,800 local residents engaging in fishing and agriculture. 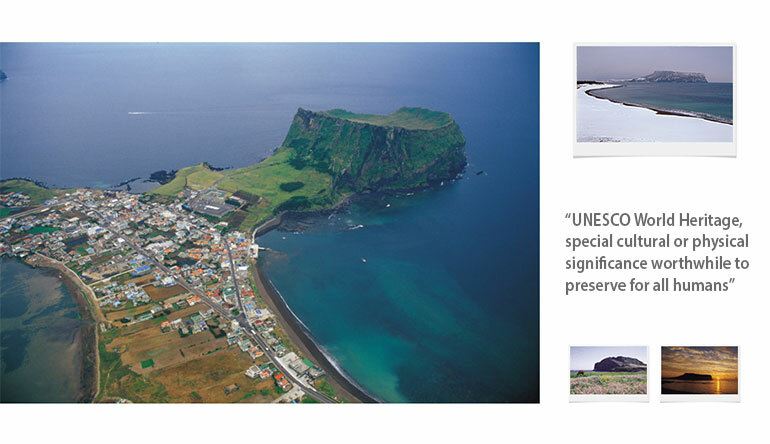 You can view Udo as a miniature Jeju island as you can experience unique traditional culture and natural environment of Jeju island such as female diver, stonewall and stone grave. In particular, you will be inundated with fun and excitement of travelling as there are so many things you can enjoy in addition to the picturesque scenery, including sea fishing, bicycle hiking, bus tour, submarine and sightseeing cruise. At Udo Summit, the height location of the island (132m), you can overlook the charming scenery of the island under your feet as well as the main land of Jeje, including Seongsan Ilchulbong Tuff Cone against the background of blue ocean right in front of you. 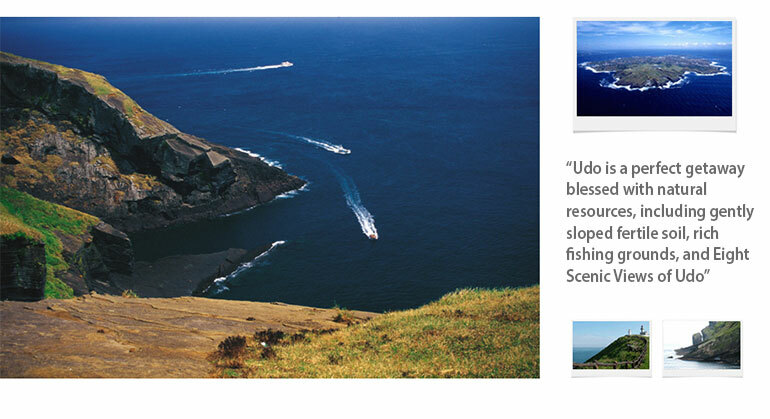 Udo tourism usually begins here down to every corner of the island. Udo has gained extra popularity as a shooting place for the movie 시월애 (A Love Story starting Jeon-jae Lee and Ji-hyeon Jeon), and if you stroll around the Sanhosa Beach you will feel as of you were main characters in the movie while enjoying pure white sandy beach and sparkling blue ocean exquisitely combined in harmony. A bed and breakfast with tea café that perfectly matches the picturesque scenery of the island opened several years ago. Looking out the beach that stretches as far as your eyes can see out of the window over a cup of tea feels just like out of this world. Udo that offers a large selection of things to do and see in addition to pure natural wonders bring some 400,000 to 500,000 visitors every year. Bukje-gun Office designated the vicinity of Udo Port and Hawumokdong Port and the coastal area of Udo that stretches some 25,863km as the Udo Marine Country Park on January 1, 2001 in a bid to preserve gorgeous natural environment and uncontaminated areas of the sea. Seongsan Ilchulbong Tuff Cone that features 182m in height above sea level is a rare volcanic edifice that exploded under the sea among numerous craters in Jeju Island that were established some 100,000 years ago. The lava was broken and ground into fine volcanic ashes with the explosion that occurred when it was mixed with water and those ashes accumulated around the crater in the form of cone. It started originally as a volcanic island and was eventually connected to the land with sand and pebbles between the land near Shinyang Beach and the island. On top of the Seongsan Ilchulbong lies a crater with 600 m in diameter. 90m in height of the bottom and some 80,000 pyeong in area. One of the great scenes in movie ‘Fear of the foreign baseball team’ produced by Changho Lee was shot here. Some of the area used to be a farmland but has turned into s silver grass filed. You may feel as if you were able to catch Udo in your hand from here. The sunrise on top of the Seongsan Ilchulbong Tuff Cone has been recognized as the greatest sight among 10 Scenic Views of Yeongju. The rising sun that blazes on the far-off horizon dyes the sea red and fascinates viewers with breathtaking view of natural wonder. It was designated as one of our natural monuments in July 19, 2000 and was officially registered as a UNESCO World Cultural and Natural Heritage site in 2007.